"Orange Whip Mid-Size Swing Trainer ORANGE WHIP PRODUCT SAFETY RECALL: If you purchased the Orange Whip Full-Size Swing Trainer (47?) or the Orange Whip Mid-Size Swing Trainer(43?) between November 2017 and February 2018, The orange ball can detach from the trainer while in use, posing an injury hazard to the user and bystanders. CLICK HERE to view the recall notice posted by the U.S. Consumer Product Safety Commission or HERE to view further instructions for replacement on the Orange Whip Website. Not Every club in your bag is the same length; therefore Orange Whip created the Orange Whip Mid-Size . Perfect for those golfers looking for a slightly shorter model or for someone looking to replicate their iron or hybrid swing. The Orange Whip Mid-Size is four inches shorter than the Orange Whip Trainer, making it more manageable for some golfers. Whether you are a Tour Player or a beginning golfer, using the Orange Whip Mid-Size allows you to feel if your swing is actually in rhythm and balance. Providing a low impact workout, the Orange Whip Mid-Size will increase your flexibility and strengthen your golf muscles. Ask any Tour Player or Golf Instructor and they will tell you it's the perfect warm up tool because it properly stretches your golf muscles properly while perfecting tempo and balance. "The Orange Whip is the best device I have ever seen to develop a correct feel for sequencing the hips and core to whip the arms and club properly." -Jim Hardy, PGA 2007 PGA National Teacher of the Year Features: FLEXIBILITY & RANGE OF MOTION: Provides a low impact stretch for core fitness and flexibility STRENGTH: Develops core muscles, wrists and forearms COORDINATION: Synchronizes the arms and body TEMPO & BALANCE: Forces the arms and body to work together. INSTANT FEEDBACK: The weighted orange ball, flexible shaft, and counter weight provide instant feedback that you feel CONVENIENCE: Recommended 5 minutes per day. Use inside or outside all year round. Specs: Patented design ? Weighted orange ball, flexible shaft, and counter weight provides instant feedback Length: 43.5" Weight: 1.70lbs Designed for seniors, women, teens, and men Simulates driver motion for seniors, women and teens, and iron motion for men and taller women"
"Orange Whip Compact Training Aid Whether you are a Tour Player or a beginning golfer, using the Orange Whip Compact allows you to feel if your swing is actually in rhythm and balance. Providing a low impact workout, the Orange Whip Compact will increase your flexibility and strengthen your golf muscles. Ask any Tour Player or Golf Instructor and they will tell you it's the perfect warm up tool because it properly stretches your golf muscles while perfecting tempo and balance. Playing and practicing during the off-season or on a daily basis is hard to do. The Orange Whip Compact offers the convenience and versatility to keep your game sharp all year long. The shorter length is ideal for indoor use and travel, and the lighter swing weight will accommodate men, women, seniors, and teens. The shorter Compact is a perfect complement to the larger Whips and is often purchased together as a package. "The Orange Whip is the best device I have ever seen to develop a correct feel for sequencing the hips and core to whip the arms and club properly." ?Jim Hardy, PGA 2007 PGA National Teacher of the Year ?If you want golf results now to improve your sense of balance, footwork and overall confidence in your golf swing, the Orange Whip is my go-to training aid. It is great for all ages and skill levels. I love it! Don?t wait to get one.? ?Kathy G-Jensen, PGA 2014 PGA National Teacher of the Year Features: RHYTHM, TEMPO, TIMING & BALANCE: ? Forces the arms and body to work together to improve the fundamentals of the golf swing. COORDINATION: ? Synchronizes the arms and body. FLEXIBILITY & RANGE OF MOTION: ? Provides a low impact stretch for core fitness and flexibility. STRENGTH: ? Develops?core muscles, wrists and forearms. INSTANT FEEDBACK: ? The weighted orange ball, flexible shaft, and counter weight provide instant feedback that you feel. CONVENIENCE: ? Recommended 5 minutes per day. Use inside or outside all year round. Great for travel. Specs: Made in the USA Perfect for indoor use and travel Whippy shaft for maximum feedback similar to the longer trainers Simulates short iron motion to sharpen your shorter shots Often purchased with the larger Trainer and Mid-Size swing trainers Length 35.5?, 1.60lbs"
"Orange Whip Wedge Training Aid The Orange Whip Wedge Training Aid is the result of the collaboration between the developer of the Orange Whip, Jim Hackenberg, and world-renowned short game expert Stan Utley. The Wedge will develop your ability to swing the club head and impact the ball with consistency and improve your margin for error around the greens. The Wedge combines the Orange Whip counterweighted, flexible shaft system with a Stan Utley inspired 56? wedge head to help you maximize your short game and lower your scores. ?I believe every golfer should possess the skills to play each short game shot with confidence and success. I am certain by training with the Orange Whip Wedge golfers will improve their short game skills and lower their scores.? ?Stan Utley, PGA Short Game Expert and PGA Tour Winner Features: Promotes short game rhythm, tempo and balance that you can feel Trains solid contact for improved distance and accuracy Develops sequencing of the body, arms, and club head release Enhances creativity and feel for every shot around the green Helps you understand how to conquer the yips Used to practice short game shots up to 25 yards Specs: Available in right-handed and left-handed models Stan Utley inspired 56? wedge head Orange Whip counterweighted, flexible shaft system Length: 35.5"? 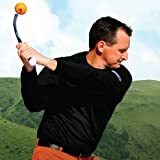 ?Weight: 1.70lbs"
"Orange Whip Junior Training Aid Designed exclusively for juniors, the lighter weight and shorter length of the Orange Whip Junior Training Aid allows junior golfers to maximize their swing tempo and balance. Feedback from the Orange Whip Junior is instant and any wobble in the swing indicates a need to improve your tempo and balance. The Orange Whip Junior will help all junior golfers naturally find the tour like motion needed to be a better golfer. "The Orange Whip is the best device I have ever seen to develop a correct feel for sequencing the hips and core to whip the arms and club properly." ?Jim Hardy, PGA 2007 PGA National Teacher of the Year Features: TEMPO & BALANCE: ? Teaches the arms and body to work together. FLEXIBILITY & RANGE OF MOTION: ? Provides a low impact stretch for your core and golf muscles. STRENGTH: ? Develops?core muscles, wrists and forearms COORDINATION: ? Synchronizes the arms and body INSTANT FEEDBACK: ? The weighted orange ball, flexible shaft, and counterweight provide instant feedback that you feel throughout your swing. CONVENIENCE: ? Recommended 5 minutes per day. Use inside or outside all year round. Specs: Made in the U.S.A. Patented design ? 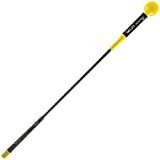 Weighted orange ball, flexible shaft, and counter weight provides instant feedback Length: 38"? ?Weight: 1.30lbs Lighter weight, smaller grip, and shorter length Recommended age ranges: 6-12 Simulates full swing motion for Juniors"